The bottom of the funnel is where you finally are able to convert your potential customer into a paying customer, whatever that means for your type of service. To this point, you have not been overtly selling anything. You’ve been offering as much value as possible to your potential customer, answering their questions and helping them feel good about potentially choosing you as their agent. You’ve spread your net wide and acquired new visitors to your site, then brought them down the funnel with a mix of content, SEO, and paid remarketing. Now it’s time to convert more of those users. This is where Conversion Rate Optimization really helps. If you can double the number of leads coming into your site seeking your services directly, then logic holds that you can potentially double your revenue as well. The same amount of users, but now they are twice as profitable. Conversion rate optimization is an ongoing strategy that can be done as you go about filling out the top of your funnel and then optimizing the middle of your funnel as well. And if you love solving problems and re-optimizing, you’ll enjoy CRO because you get to test, retest, and validate or invalidate your hypotheses time and time again. Email marketing is truly the unicorn of full funnel marketing because it can also be used to bring people to the point of conversion. Every email marketing software worth its salt will have ways for you to move users between different automation sequences depending on what emails they open and the links they click within those emails. As your email marketing program becomes more mature and you learn the ways that people interact with your emails as well as the emails that convert well or don’t, you can add on more robust segmentation to either lengthen or shorten the time to conversion depending on how your potential customers behave. The most important thing to make sure you implement from the start is good analytics on what users are opening and clicking (or not opening and clicking) within your emails so that later on you can come back and optimize your emails to convert better. Real estate marketing is a fascinating beast in our current times as it is constantly changing and the small agent vs large public portal battle rages again and again. Luckily for you, with smart marketing you can be quite successful as a real estate agent in this digital and increasing mobile world! 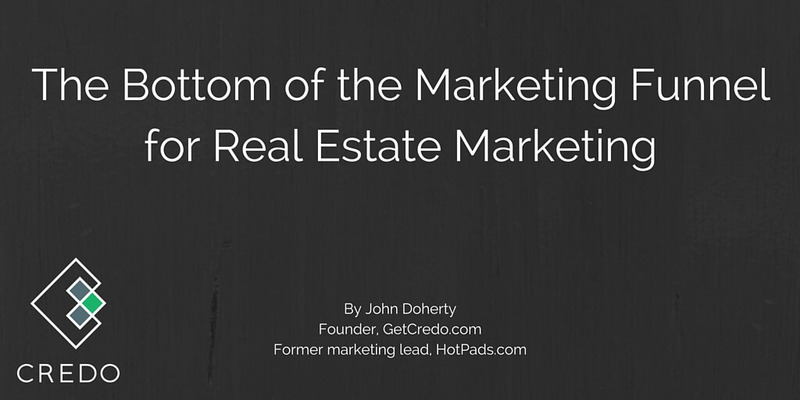 John Doherty is the founder of Credo (GetCredo.com), a marketplace dedicated to helping businesses like you hire the right digital marketing consultant or agency to help you grow your business. John is a digital and growth marketer by trade as well, consulting mainly with marketplaces to help them accelerate their B2C customer acquisition. In his spare time, he lives in San Francisco with his wife Courtney where they ski, cycle, rock climb, and adventure often with their large black labrador Butterbean in tow (or leading the way).